Ghata Chaturdashi is the 14th day of Mahalaya Pitru Paksha period. This is an exclusive day of oblations for those who have died an unnatural death like snake bite, accidents, suicide, war or other calamities. This day is to bring peace upon the distressed wandering soul that was victim to an unnatural death. It is compulsory to perform the Ghata Chaturdashi oblations for the souls that died an unnatural death, failing which, would lead to obstacles and negativity in the lives of the alive family members. 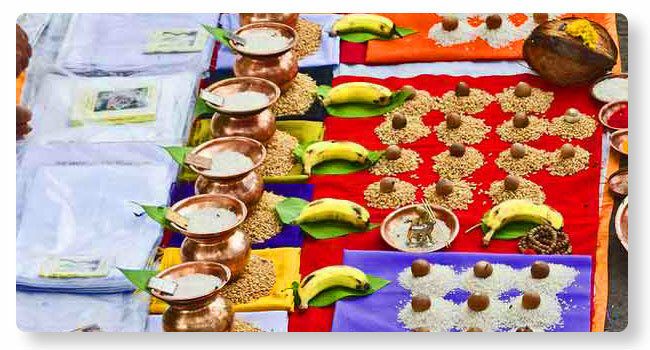 Shraddha Sankalpa – an annual subscription based service for Ghata Chaturdashi is available for a subscription period of 3 years, 5 years or 10 years.